Hermes is the UK's leading consumer delivery specialist, and handled more than 335 million parcels last year. They provide a range of flexible and affordable delivery options to home, work, neighbour, safe place or ParcelShop that are convenient for the consumer and fit within people's increasingly busy lifestyles. Hermes has been experiencing the enviable problem of increasing parcel traffic through their flagship depot in Rugby. This increase in parcels also includes “ugly traffic” an industry term for bulky, out of gauge, non-machinable parcels such as flat pack furniture, car exhausts and ironing boards. Hermes realised that they required a more economic and speedier way of dealing with this increase in traffic especially the “uglies”. According to Apex Insight who provide fact-based consulting work “ugly” traffic currently represents 5% of the parcels market by value. Much of this awkward work was processed by hand, which inevitably slowed down the transit of the parcels through the network, resulting in a reduction of the number of parcels that can be sorted in peak periods and an increase in damages and missorts due to human error. All this and the potential for revenue loss caused by an inability to accurately weigh and measure the “ugly” traffic and correctly invoice customers. After initial discussions with the client about their requirements including anticipated traffic type and volumes, L.A.C. 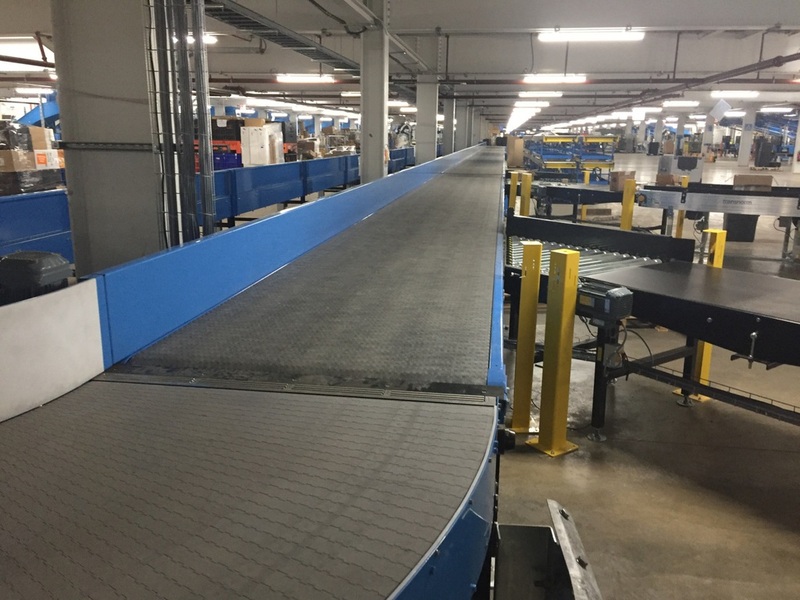 Conveyors & Automation produced conceptual solutions and drawings to help deliver the best possible resolutions for the new parcel management system. The design that provided the greatest flexibility was a high-speed, semi-automated carousel modular belt conveyor that would replace the several existing manual sorting systems and could be integrated with the latest auto-scanning, volumetric and weighing technologies. The specification for the carousel conveyor required that it should be made from heavy duty acetal plastic 2” pitch modular belt with a 5mm thick steel bed which could handle 50kg per meter. The straight length of the conveyor on either side is 52m. 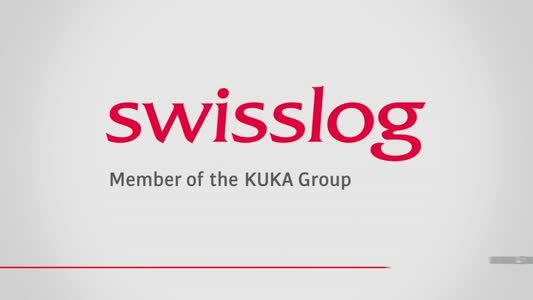 In reality the design can easily cope with 75kg per metre and could go up to 100kg per meter with a result that the belt can withstand heavy loads being dropped onto it. 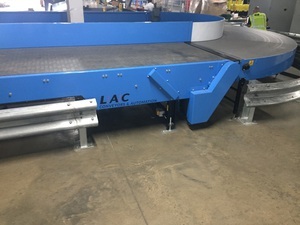 With a tight 180degree radius turn and an inner radius of 1000mm at either end to keep the flow of items moving along the 52m straight runs. 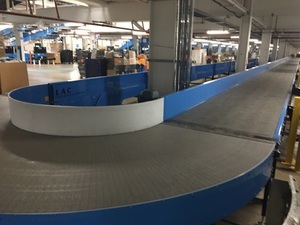 The conveyor is able to move parcels up to 2m in length and with a 1.2m wide belt there is plenty of room for items ensuring that they won’t fall off. 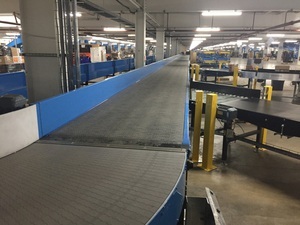 Transfer plates at conveyor join points means that even the smallest of parcels are able to transit the system. 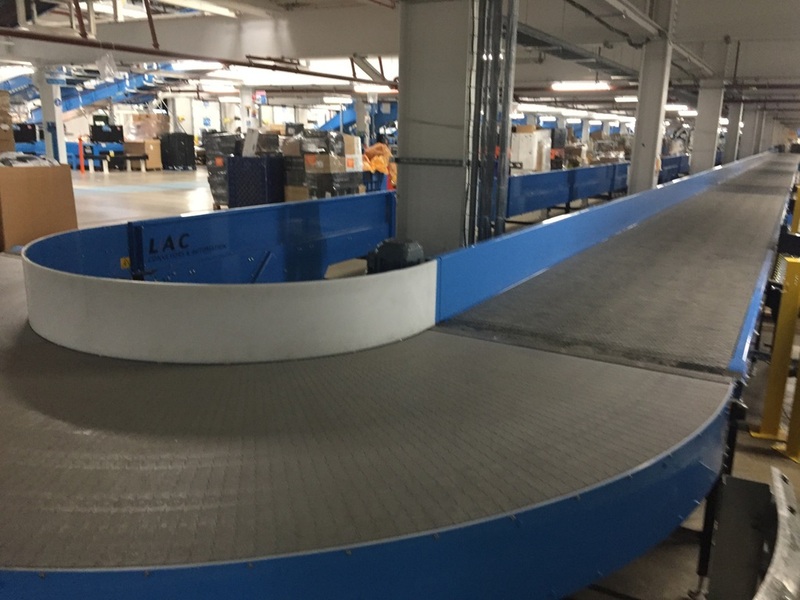 The new conveyor system had to be put in place without interrupting the depots very busy work patterns and the L.A.C. installation team were able to successfully achieve the installation and commissioning over a two week period. 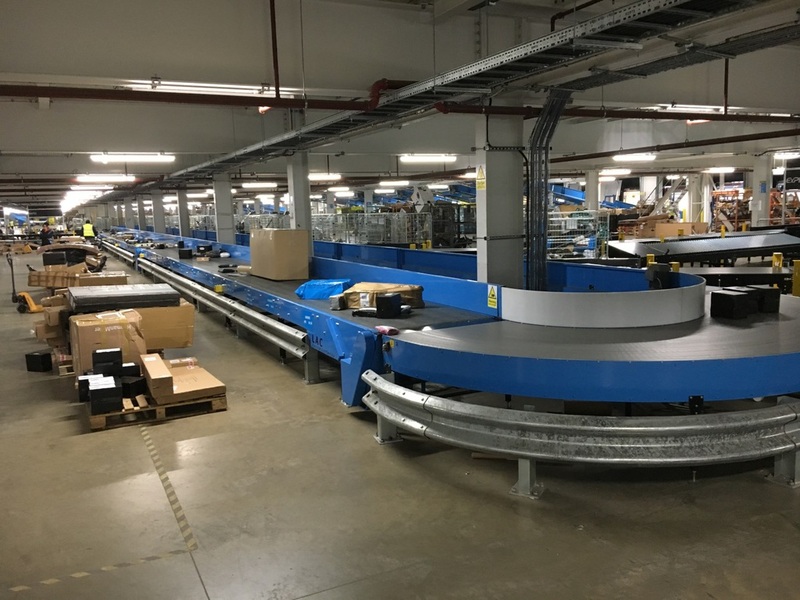 Hermes now has a new high-speed system that can handle up to 4,000 items per hour to over 60 destinations with the potential of boosting productivity by over 30% and because it is integrated with the latest scanning and weighing devices, all parcel types are now accurately identified and invoiced saving time as well as ensuring that valuable revenue streams are protected.